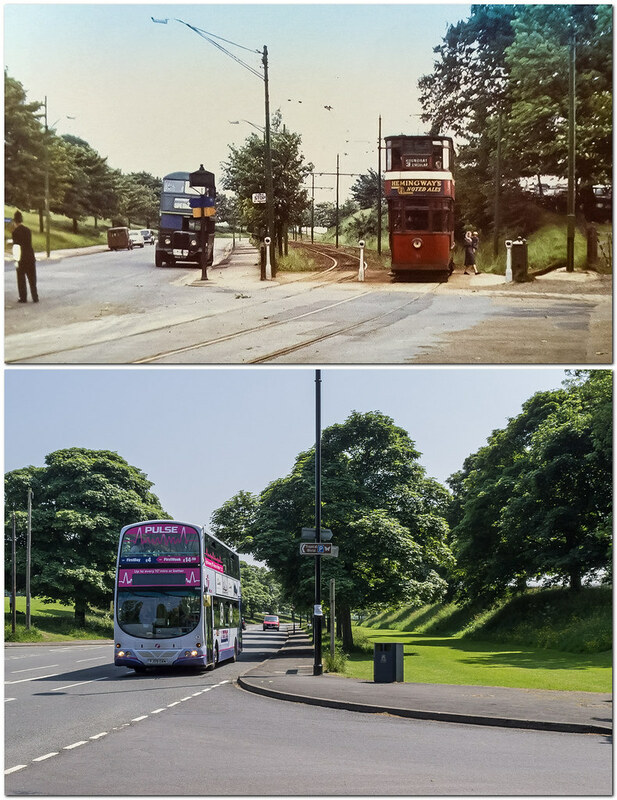 Then and now, travel to Roundhay Park. Those are fascinating then and now images Brunel. The trees are a lot bigger now!! Thank you for such a lovely top picture Brunel. Some of those trams has front and backs open upstairs so you went through a door from the cabin and braved the elements. Happy memories. Nice pictures Brunel. The "street furniture" is interesting (to me at least). It looks as though the original pole for the overhead tram wires (in the middle of shot) has survived to this day. There is what looks like a gas street lamp in front of the old bus with AA & RAC signs attached to it. It does look as though the glazing on the gas lamp is blacked out for some reason. Could that be a hangover from the blackout, I wonder? I like the way the 1950's electric street lamps have been bolted onto the old posts. Their design is "futuristic" like something out of the 1951 Festival of Britain. Any idea of the date of the old photo? Chamberlain tram 91 painted in unlined red and white livery - 21/12/1952. Paint in well worn condition, so later than this. Tram 91 last in sevice, 17/6/1955. I started going to watch United at Elland Road when Football resumed after W.W. 2. and i remember that the Tram /Bus Conductors, Drivers used to congregate about three quarter time at one corner at the Elland Rd end as the gates were opened then. what i can't recall is was it at the Lowfields Road Coner or the corner where the main entrance is ? I know that there were lots of them watching the last 20 mins or so..
Re LCT bus crews at Elland Road, the ground has changed a lot over the years but in the days when I regularly did duty there, (late 60's and seventies) they were allowed into the corner between the West Stand and the Lowfield Road End Kop. The gate from the car park into the ground at that corner was controlled by the police and used for official police entry into the ground. I can't remember when it was built but there was a small police station under the West Stand in that corner. There were more extensive facilities later when the stadium was further developed. I don't know on what basis uniformed LCT personnel were admitted but it was just something that happened. When you think about it, there wouldn't be much point expecting them to have a kickabout on the car park. Nice photographs Brunel thanks for the post. [quote="jma"]Re LCT bus crews at Elland Road, the ground has changed a lot over the years but in the days when I regularly did duty there, (late 60's and seventies) they were allowed into the corner between the West Stand and the Lowfield Road End Kop. The gate from the car park into the ground at that corner was controlled by the police and used for official police entry into the ground. I can't remember when it was built but there was a small police station under the West Stand in that corner. There were more extensive facilities later when the stadium was further developed. As my brother and i had relatives in Beeston some Saturdays if we did not have a tanner (6d.) each to go to a home game we would walk down Wesley St. about 4 p.m. and wait until thr gates were opened, Only then could the Public and the L.C.T. people enter. Fortunately in those days if you played football for your School team you could have a free blue ticket for a United game so i managed to see most matches from the Boys Pen at the Lowfields Road end.